Annaliese ended up with three pairs of striped leggings from Old Navy. We both love them a lot. While we were home for Christmas, Kathy and I tag-teamed a shirt to match her navy and aqua striped leggings (I'll post pics as soon as I remember to take them). 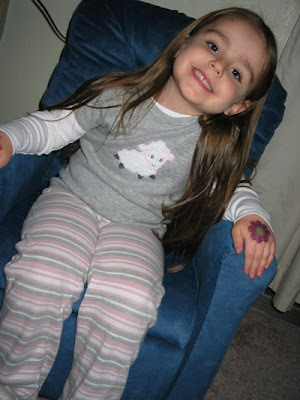 Last week Annaliese decided she wanted to wear her pink and gray striped leggings. The only t-shirt I had that matched was a plain gray shirt. When I showed it to her she said, "There's nothing on it!" and proceeded to pick out a whole new outfit. So embellishing that t-shirt quickly went on my to-do list. While I was searching through designs, Annaliese said she wanted a bunny. I remembered a cute applique bunny from Embroidery Library. When I pulled up the animal set to show her, she changed her mind and picked the lamb instead. Lucky for me, a couple days later the set was a part of the stitcher's showcase and was 40% off! So for $3 I got all five designs. 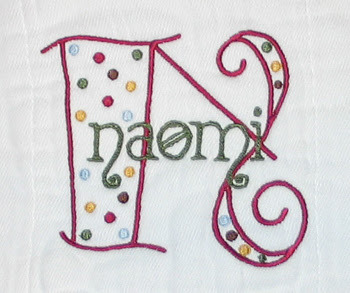 I used a piece of the minkee that I bought for Naomi's blanket for the applique patch. The final product is cute, but I learned a few things. 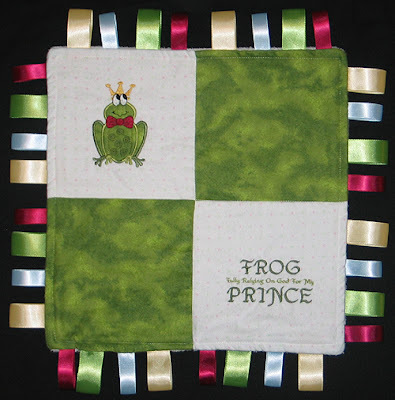 Next time I applique minkee, I will use a contrasting thread for the tackdown stitch. I used white thread on the white minkee, and it was challenging to see where to trim amidst the fluff! I had to do some careful trimming once I was done because some of it poked through the satin stitches. Next up... a Valentine's Tee to match the cranberry and pink striped leggings. I recently got a couple more font options, so Sabrina is one of the first to pick Embird Alphabet #8. I love this font! I used it on one other order last week, and plan to use it again today! Going big time, shipping international!! 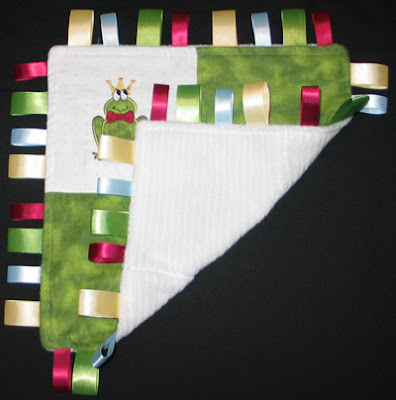 Siena (and her parents) liked her hooded toddler towel so much that they ordered one for her cousin's birthday. Rowan lives in Scotland, so I shipped internationally for the first time! 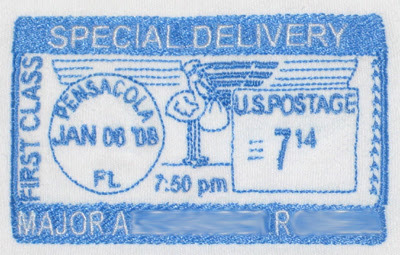 Here are the two Rachel ordered for friends from school, my first non-Tallahassee designs! Well, it may seem to my faithful readers that I have taken the week off. Actually, I've been so busy filling orders this week that I haven't taken the time to update my blog! 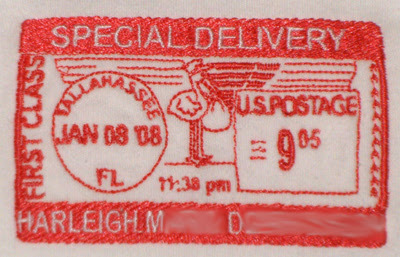 Virtually all of the items my friends ordered were gifts, so as I get permission from them to post, I will update my blog. 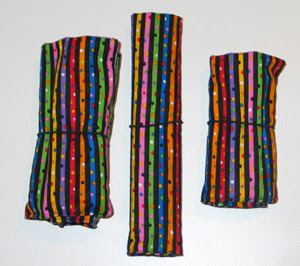 I used Kathy's machine to make Annaliese a new matching set of coloring utensil rolls. One holds 8 markers, one holds 12 crayons, and the other holds 8 colored pencils (which I can do on my machine). This time instead of using ribbon for a tie closure or making an embroidered velcro closure, I used ponytail holders. These are the cheap kind, so they are extra stretchy, making it easy for Annaliese to pull off and on herself. I did stitch out a few extras while I was there. Kylie and Kenzie got a set of marker and pencil rolls to go with the crayon rolls I made them in July to match their tote bags. And I have two more marker rolls reserved for a friend who expressed interest. If she doesn't want them, they'll be up for grabs! Sorry I didn't get more made while we were in IL... I was having too much fun making my first A-Line dress! 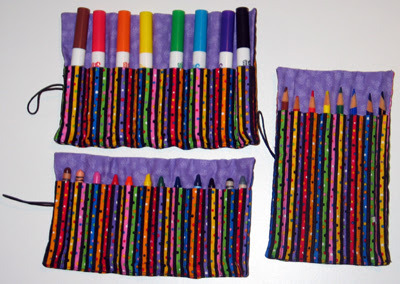 Keep in mind that I CAN make a crayon roll for 8/9 crayons, an 8-pencil roll, a 4-marker roll, and a 6-toddler crayon or chalk roll. Lots of options for what can go inside, and now three options for closing them, tie a ribbon bow, personalized velcro closure, or a ponytail holder! 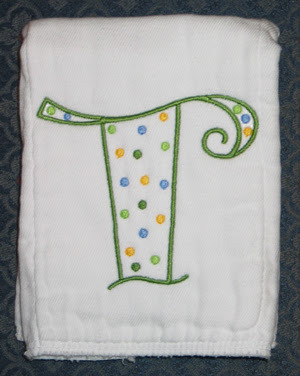 I mentioned in my last post that the Monogrammed Burp Cloth using the Dot Alphabet has become my consistent gift for all the new babies, but I realized the first baby of this round at church didn't get one! 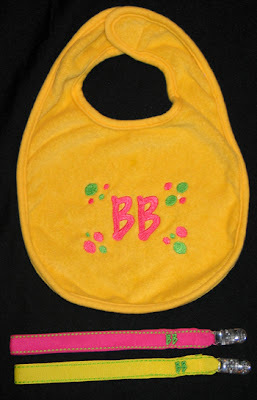 Rachel wanted to keep the gender of her baby a surprise, so baby Tre didn't end up with any monogrammed gifts from me. That was rectified this morning! 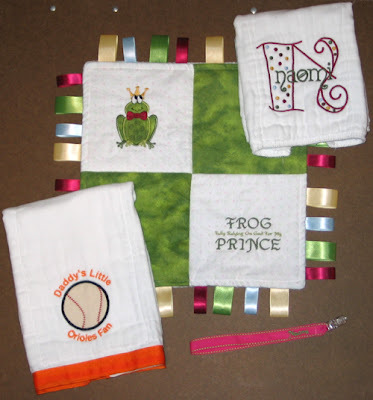 My goal in May or June is to get a big group shot of all the moms, babies and burp cloths. What are the odds I can get all 7 moms/8 babies together at the same time and remember my camera?!? Today was baby shower #5 at church! Kenia is expecting a baby girl. 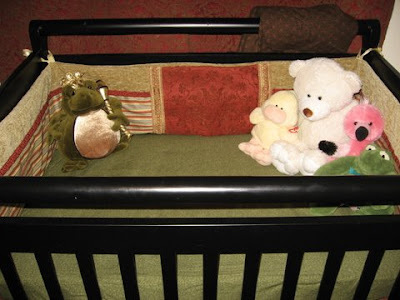 Big sister Roberta likes purple, so Kenia suggested focusing on pink for baby Alina. I took a blanket buddy, 2 burp cloths and a pacifier clip as my gift. Baby Alina is the recipient of my first Blanket Buddy. 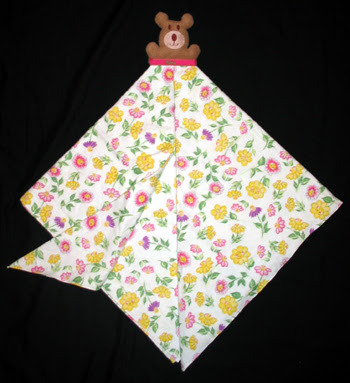 The design came from Sewing For Sarah. I first took a 40" square of flannel and hemmed it using my rolled hem foot (that's one of the coolest feet ever!). 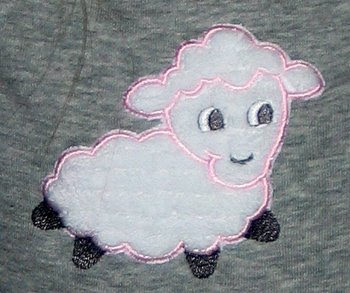 Then I stitched out the design following her directions. It worked perfectly! 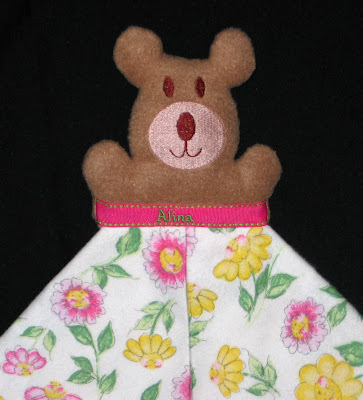 When I made Alina's pacifier clip, I stitched an extra piece of ribbon so I could personalize the Blanket Buddy, too. 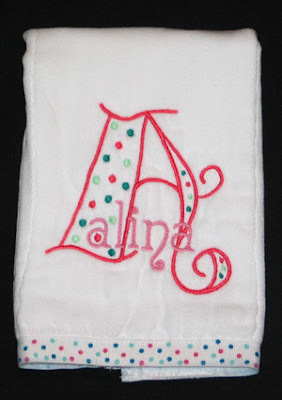 Next up is what has become my signature gift, a monogrammed burp cloth using the Dot Alphabet and Acadian fonts, both free designs on Sew Forum. 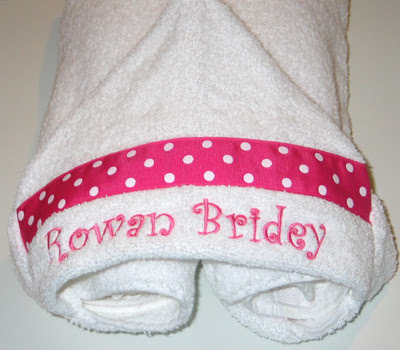 I had fun trying to match threads to the cute polka dot ribbon. For the other burp cloth I modified a design from Perfect Little Stitches. 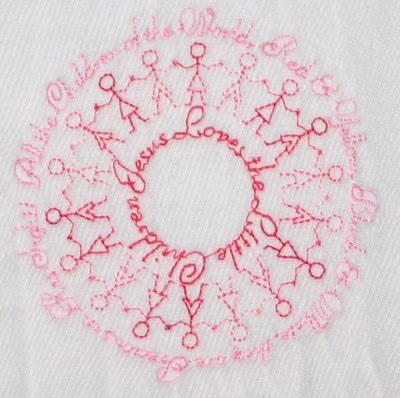 It only had the circle design of boys and girls holding hands; I added the text with Embird Alphabet #22. In case you can't read it, the inside circle says, "Jesus Loves the Little Children" and the outside continues the lyrics, "All the Children of the World, Red & Yellow, Black & White, they are Precious in His Sight!" 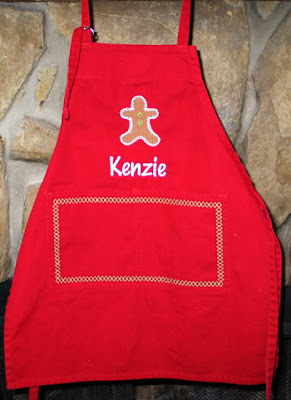 I was pleased with how this turned out, especially stitching the children with variegated thread. 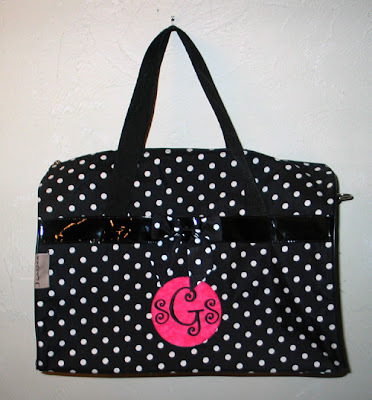 Tiffany asked me to to monogram a bag she bought for a friend. 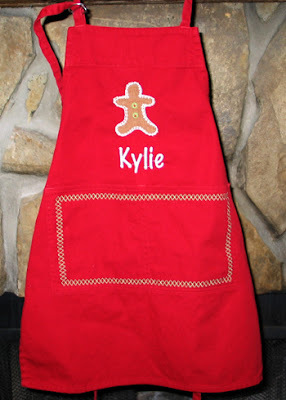 I don't have an industrial type machine, so I couldn't hoop the bag and monogram it directly in the position she wanted. Instead I did an applique patch (same method as I used for Roberta's bag) and hand stitched it in place. I used Embird Alphabet #17 for the letters. 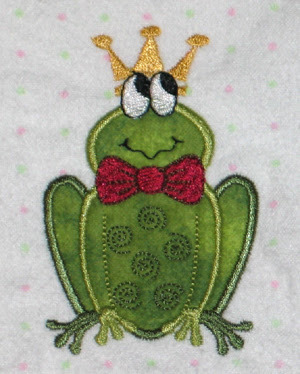 I used an applique frog design from Hatched In Africa's Funky Frogz designs. I added a crown to make him a frog prince. I used Embird Alphabet #33 to add the text to another square. So the front is a 4-patch of flannel, the back is super soft minkee-like fabric, and there are loops of satin ribbon around the edge to make it a multi-sensory lovey. 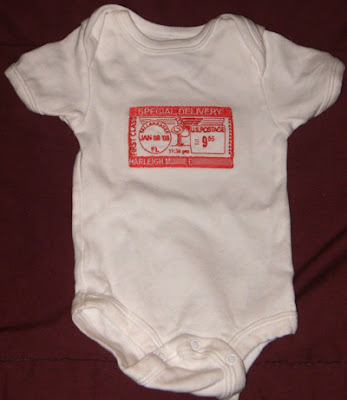 I wish my blog included feel-o-vision, because it's SO SOFT! :) I don't think the colors are a perfect match, but I was pleased with the results. Minkee isn't the easiest thing to work with, but I learned a lot, and the next one should go more smoothly. 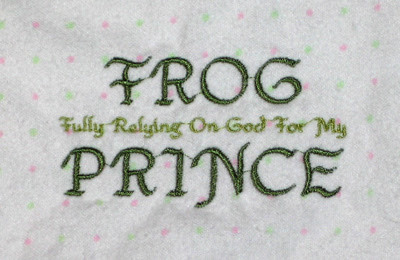 Next is a burp cloth that Daddy will be proud to use among all the pinks and purples. 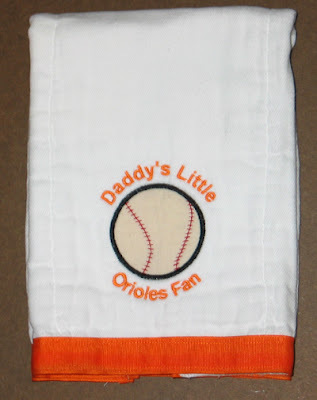 JR is a huge Orioles baseball fan, so I used the baseball sucker holder designs from Embroidery Garden (a freebie on her yahoo group) and added the text with Embird Alphabet #2. Carlin helped me out on this one. 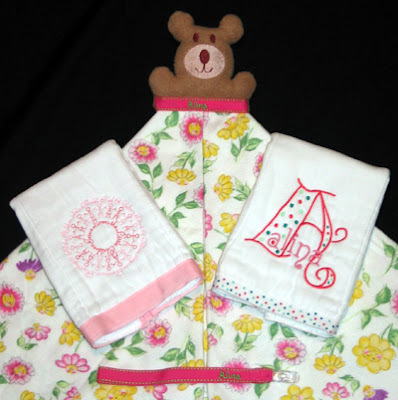 I wasn't going to actually do the applique since it was a white ball on a white cloth diaper. But when I showed Carlin the design on screen, he ran to get his baseball and showed me the color and texture. So I dug through my stash and found a heavy linen fabric that worked really well. I'm glad I asked his opinion! JR and Daisha also get to do some research for me. 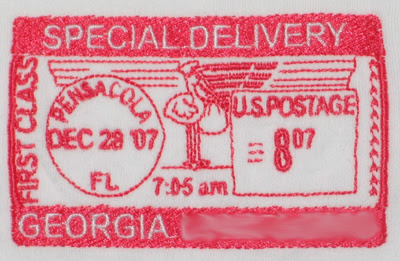 Last time I ordered cloth diapers from Stitched and Stamped, she was running low on the infant size and substituted the regular sized cloth diapers instead. They are significantly bigger, so now I can get input on which size is really best for future purchases. And finally, a pacifier clip. Doesn't match anything else, but is bright and girly! The fifth shower is in a week, so back to the sewing machine!